Looking over my posts from the last few months I can't believe I haven't talked about one of my personal favorite models... the 1927 Barrel. Produced from 1927 through 1930, the Barrel was one of the early geometric models (like the Cushion, Tonneau, Square, etc) named because of it's shape. Depending upon the year, it was available in solid and gold filled, in yellow, white or green gold and even in silver! 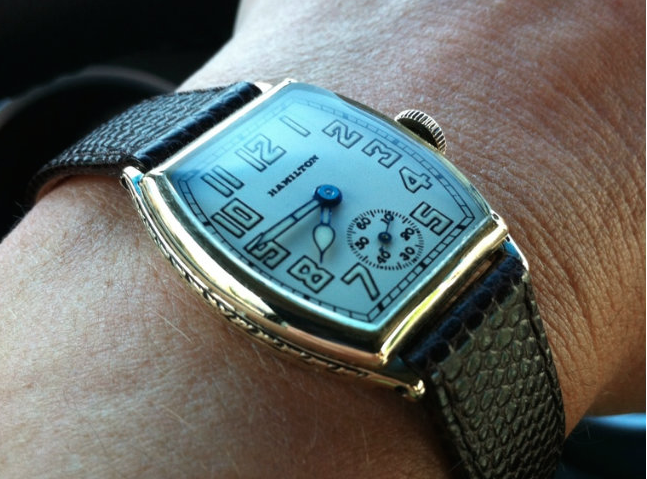 The most common versions seen will have a 17 jewel, 6/0 size 987 movement behind the dial. Although I've seen versions with a 986A (no second hand) as well as a 986 with the second hand at 9:00. As far as I know these are exceptionally rare. 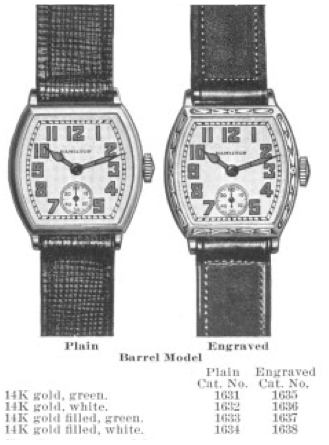 Models came as the "Barrel Plain" and "Barrel Engraved". The main difference is the bezel on the engraved model is just that... engraved. The center case is engraved on both models. One of the reasons I like the Barrel is it's a decent size watch. Dare I say large? 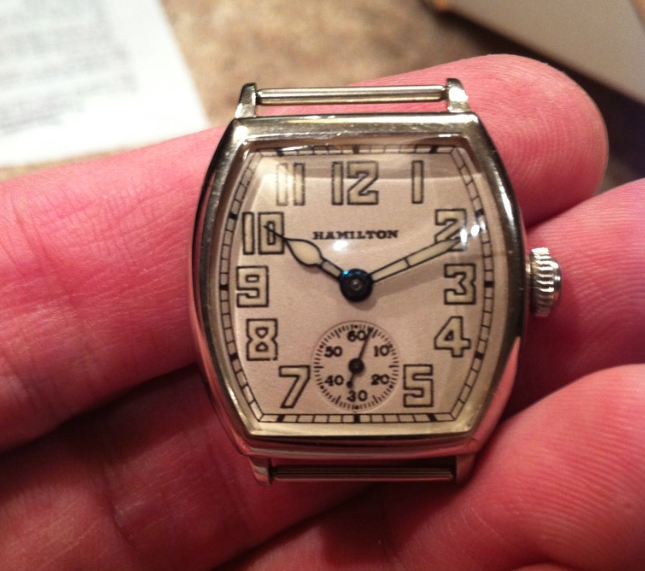 Probably shouldn't go that far but it is a good size for a vintage watch and larger than many other period models. The Tonneau probably has it beat in "largeness", but not by much. Here's a before and after example of a white barrel plain I once restored. 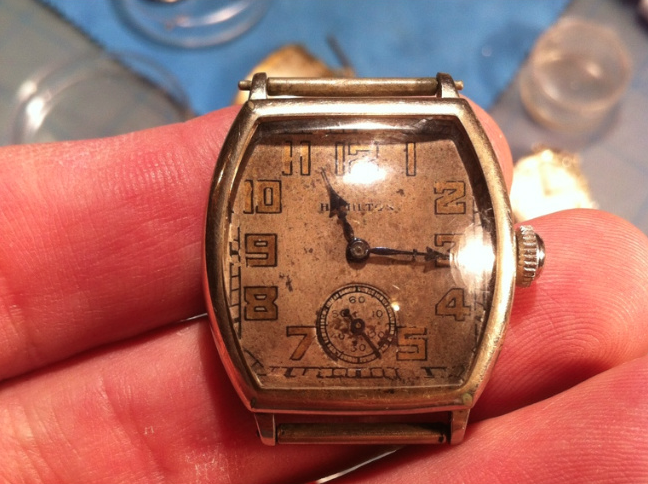 As received, the watch had a Square Cut Corner dial installed so getting a proper dial was a great first step for restoration. An overhaul of the movement, new hands with fresh lume and a nice glass crystal completed the finished project. Here's a wrist shot of a green gold filled Barrel Plain... you can see the nicely engraved center of the case. 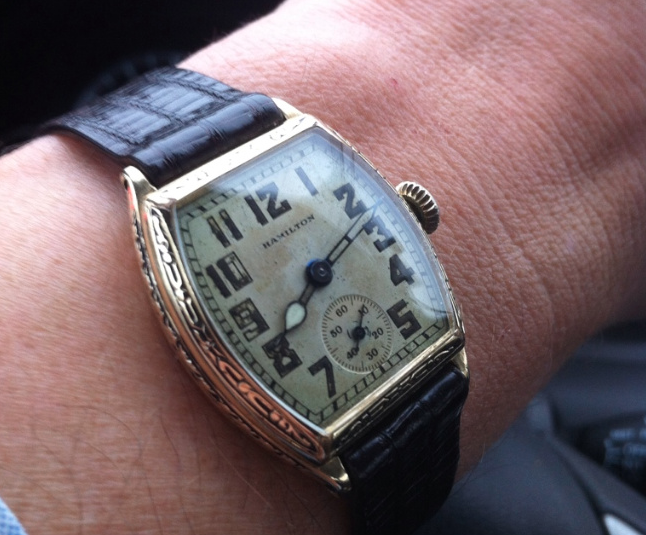 And here's a wrist show of a nice Barrel Engraved with a nicely aged dial. And here's a couple a very nice studio shots of Barrels, courtesy of another Hamilton enthusiast, Tom Diss. 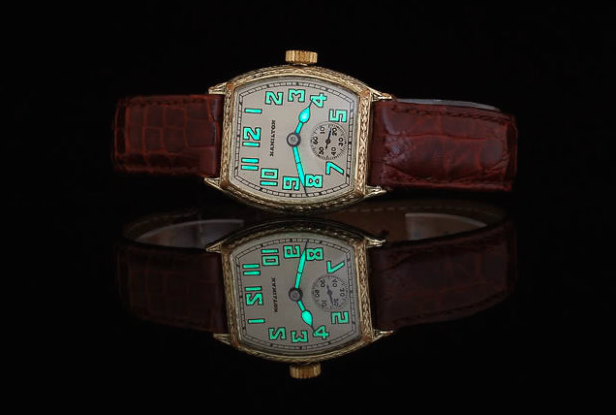 I really love this shot with the glowing lume... always a challenge to capture clearly. And since I'll probably never have one to share myself, I'll touch briefly on the 2nd generation Barrel model, called the Barrel B. The B was introduced for only one year - 1931 and I don't believe it showed up in the catalogs. 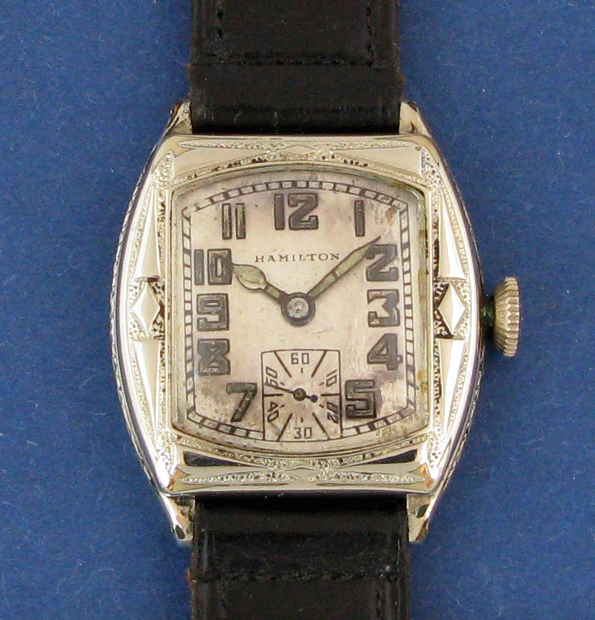 It's quite rare and the case is barrel shaped but the dial and crystal are more tonneau shaped. 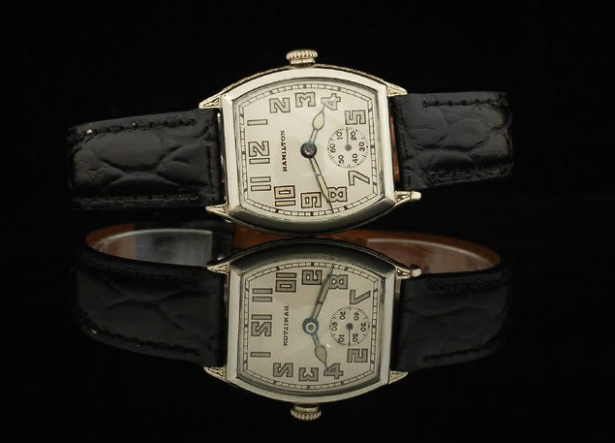 As you can see from the photo below - the engraved bezel is a dramatic difference from the original Barrel model and showcases the art deco aesthetics that were so popular during this period. It would be really cool to have one someday - but to be honest, I kind of like the design of the original Barrel more. I enjoyed your writing about the Barrel models and have come to realize, after looking at the above photo, that I have a Barrel B 2nd generation watch in pretty nice condition. I can't find any info on what it may be worth. Anyone have an idea on value?